Terribly sorry if I’m repeating myself here, but I think that this lovely little lip treat deserves another mention. At any rate, I can’t find an individual review for it here on A Model Recommends, and I want to add it to my Lip Balm category. It’s a product that I’ve used for years – it was always one of my “two products one of which must be skincare” when I was obsessed with Clinique Bonus Time. (Anyone else have about sixty-eight little Clinique “bonus time” makeup bags in the bottom of their wardrobe?) I use All About Lips as a kind of “prep” for the lip area to smooth the skin and help blur those tiny little creases and lines that tend to appear around the mouth. What I love about it is that it’s completely free from greasiness or stickiness – it’s just a light cream that absorbs quickly and leaves the lips soft and – do I imagine this? – slightly plumped. It’s great to use before you start your makeup – by the end of foundation, bronzer, eyes and all of that jazz your lips are perfectly ready for the tinted balm or lipstick or whatever it is that you want to use. I wouldn’t say that All About Lips is a balm – it doesn’t seem to form any barrier or protection from the elements – so it’s perfectly acceptable to use it underneath everything else you’re piling on. It’s silicone-heavy, which is what gives it the light-yet-slippery feel, I’m guessing, but I don’t seem to have any problems with silicones in skincare so that’s fine by me. Careful if you’re sensitive to them though – it’s always worth having a test at the counter. 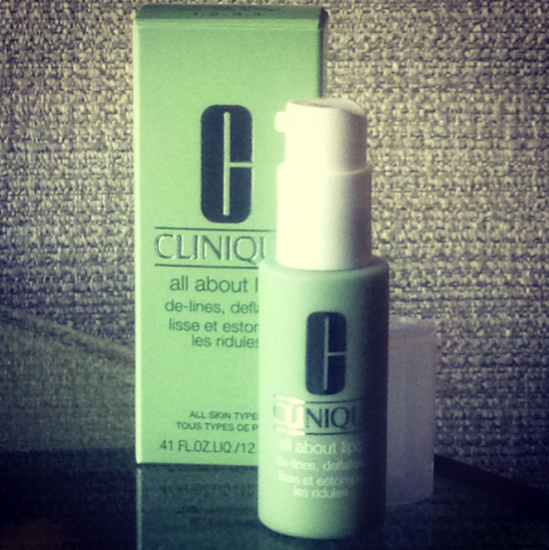 In summary, Clinique’s All About Lips is good for blurring and smoothing over fine lines and knackered-looking lips. Not so good for dryness or “protecting against the elements”. Clinique All About Lips is £16 from Boots.com and counters nationwide.